Come, brandish (the sickle), plow the furrow. Harvest, work the sickle, it is time for the first harvest to begin. “How much effort did Adam (the first man) have to exert before he had bread to eat! He ploughed, sowed, reaped and bound [the sheaves]. He threshed, winnowed and sorted, ground and sifted [the flour], he kneaded and baked, and only then did he eat” (Babylonian Talmud, Brachot 58a). In this Midrash, the early 2nd century Talmudic sage Ben Zoma recounts all of the actions that man must undertake in order to produce bread, and he does not even mention all of the potential setbacks –drought, the hot easterly wind that can scorch the wheat before it ripens, fire, robbers, diseases and insect infestations, just to name a few. One of the most common problems in a wheat field is the germination of plants other than wheat that can take over the field, severely impeding the normal development and ripening of the desired wheat crop. One of the most common weeds to fall into this category is the bishop’s weed (Ridolfia segetum), a herbaceous annual plant in the Umbelliferae family. The plant is native to the Mediterranean basin (as is wheat), and it is the only plant of its genus in Israel. Bishop’s weed (also known in English as “false fennel”) thrives in heavy soils, which is why it grows primarily in wheat fields. The plant blossoms at the same time as wheat – in the late spring, from April to June, and can reach a height of 80 cm (about 32 inches) and more. Bishop’s weed produces relatively large yellow, umbrella-shaped flower clusters (hence the Latin name – umbelliferae) each made up of hundreds of very small flowers forming an impressive and highly visible head of composite flowers. Various parts of the bishop’s weed contain essential oils with a very pungent fragrance, the flowers are edible when young, and the whole plant pickled or cooked. The leaves can be used as a spice, similar to dill (Anethum graveolens) and fennel (Foeniculum vulgare). Parts of the plant can be used to preserve or pickle cucumbers, olives, and more. The essential oils have medicinal purposes, to help with flatulence and respiratory difficulties, as well as getting rid of lice and increasing production of breast milk in nursing mothers. While the bishop’s weed is not mentioned by name in any of the traditional Jewish sources, some researchers identify it as the “bad-smelling weed” – ba’sha mentioned in the verse “In place of wheat, brambles will grow, and in place of barley, a bad-smelling weed (ba’sha) (Job 31:40). The verse parallels brambles with wheat and ba’sha with barley, thus emphasizing the common heavy-soil habitat of these plants. The late Yehuda Felix, professor of biblical zoology and botany, said that based on the verse in Job, the 3rd century Israelite Mishnaic sage, Rabbi Hoshaya taught that “This is how the Torah teaches you about the earth’s features: a field covered with brambles is good for sowing wheat, and a field covered with ba’shim (plural of ba’sha) is good for growing barley” (Midrash Tanchuma, Re’eh, 15). The month of Sivan, now upon us, marks the end of the 49 days of the Counting of the Omer, that begins the day after Passover, and the start of the months during which the ancient Israelites would bring the offering of the first fruits of their harvest to the Temple in Jerusalem. All of his work, his energy and his efforts will be reflected from this point on in the quality and quantity of the produce that he would harvest. If allowed to run wild, the bishop’s weed can overwhelm the farmer’s crops. But if kept in check, it adds beautiful color to the field and can be used for culinary and medicinal purposes. However the striking tall yellow weeds also serve as a living testament to the ongoing battle of the farmer to bring food from the earth. With that in mind, looking at the fields of wheat and barley at Neot Kedumim, which are cultivated in a manner similar to that of our ancestors, we can truly appreciate the words of the psalmist, “When you eat the labor of your own hands, you shall be happy. And it will be good for you.” (Psalms 128:2). Wishing you all a very Happy Shavuot! (1) Feliks, Y. “The Biblical Plant World” (Hebrew), p. 216. 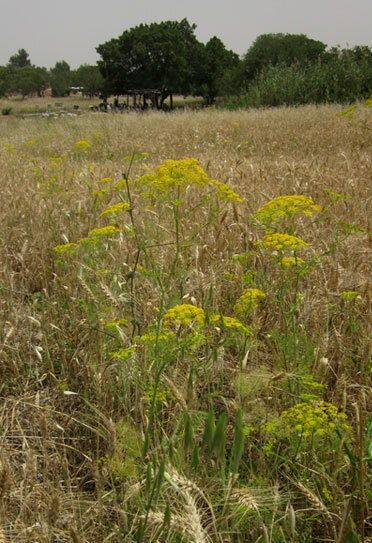 The Hareuvenis, on the other hand, identified the ba’asha as the dwarf thesium plant (Thesium humile).